Private collection, by whom acquired from the above before 1985. A gift from the above to the present owner. There is an air of elegance and decadence to the elongated figure of L'amie de Mrs Edwards. This work appears to be a portrait of one of the glamorous people whose circles Van Dongen had begun to frequent in the early 1900s, a process that would come to provide the artist with an endless source of inspiration and material for his paintings. Even before his years as a Fauve artist, he had been a witness to fashionable life in Paris, and sometimes to its seamier underside as well, and documented both in his paintings, which are colour-drenched celebrations of the high life and the beau monde. In L'amie de Mrs Edwards, the Fauve influence is clear in the colourism with which the subject has been rendered, not least evident in the dominance of his trademark green to lend a sense of shadow on the skin. This use of a pale shade of green is made all the more expressive through the deliberate contrast with the red both of the background and around the woman's eyes. Van Dongen has used these opposing colours to create an internal dynamism within the painting, a sense of its own incandescent energy that makes vivid the pulse of the life that it depicts. An engaging touch is added by Van Dongen's use of the white in one of the ear ornaments, which adds the sense of sparkle, of reflected light, of diamonds, perhaps even of flash photography. All this combines to sharpen the palpable atmosphere of glamour in which L'amie de Mrs Edwards is steeped. 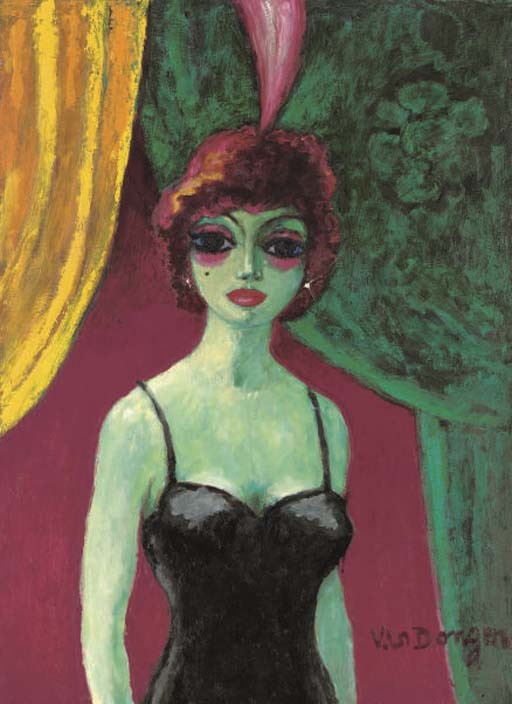 While it is clear that Van Dongen is exploring the legacy of his Fauve period in the colourism of this painting, the elongated body and the large eyes of the subject indicate that this painting dates from a later period. This focus on form itself came about in part as a result of Van Dongen's increasing interest in the paintings of Cézanne. Now, rather than focussing on colour alone, and crucially on the interplay between various colours, Van Dongen explored the structure both of his pictures and of the scenes that he depicted, introducing a new dimension of sensation, a new and more complex aspect to the process of viewing that is itself sophisticated, reflecting the sophistication of the world portrayed.